In the Queue, the boys discuss the new Minnie and Friends Character Dining at the Hollywood and Vine restaurant in Disney’s Hollywood Studios. CLICK HERE to access the article we referenced in the show. In the Hub, we introduce another new series of Hub topics called Plus It! To “plus” something in the Disney universe is to make something better and make it more extraordinary. Success is always in the details for Walt Disney and his company. So, in each series, we will be discussing how we would plus different areas in the parks. For this show and MOW #088, we will talk about the Magic Kingdom in Walt Disney World. On this show, we talk about how we would “plus” Adventureland, Frontierland, and Liberty Square. On MOW #088, we will discuss how we would “plus” Fantasyland, Tomorrowland, and Main Street, U.S.A.
How would you “plus” these particular sections? Did you like our ideas? Did you dislike our ideas? Any comments? Share them at magicourway@gmail.com. In Guest Services, we get to chat with the one and only Joshua Roberge and his wife, Rachel, regarding their love of Disney and Joshua’s upcoming mini-race against our very own Lee Lastovica during the 2015 Food and Wine Half Marathon at Disney’s Epcot. To support Joshua and Rachel’s charity run at the 2015 Disney Wine and Dine Half Marathon for Pitching In for Kids, go to their website RIGHT HERE and let them know that you are a fellow MOWican! JUST DO IT! If you would like to contact Lee directly, you can find him on Facebook at http://www.facebook.com/lastovicatravel or email him at lee@magicourway.com or call him at (832) 570-5490. Lee is now with Magical Moments Vacations, an Ear-Marked Travel Agency. You can find them at www.facebook.com/MagicalMomentsVacationsMain. Book a vacation now! Leave us a voicemail from your phone using our new toll-free number, 1-844-HARAMBE, DO IT!!! NEW! Text us or leave us a voicemail message at our new number, (815) MOWICAN (815-669-4226). Thanks again for listening to us. We do realize that you have many choices when it comes to Disney podcasts and we appreciate your attention. 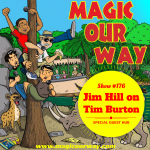 The Magic Our Way Podcast is entertained by Nicholas Cage. MOW #088 – PLUS IT! Walt Disney World’s Magic Kingdom: Fantasyland, Tomorrowland, & Main Street, U.S.A.